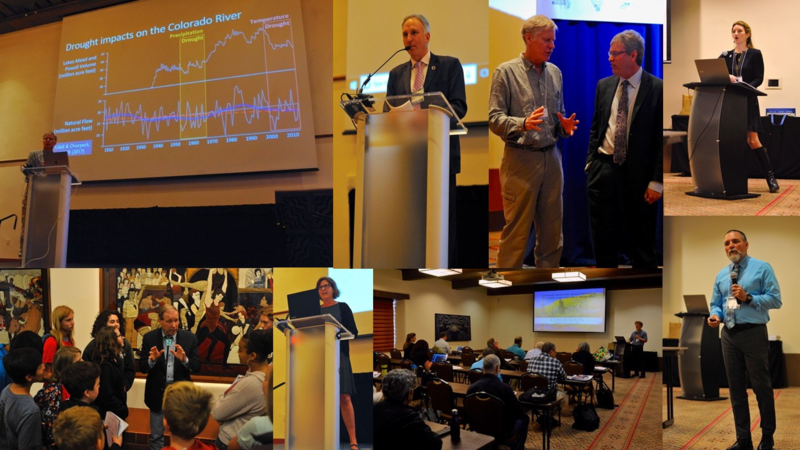 The 3rd annual Next Generation Water Summit will be held on June 12-June 14, 2019. The Summit focuses on water conservation and water reuse in the arid Southwest. It brings together builders, designers, architects and water professionals to share best practices and brainstorm new ones through charrettes. Click the link below to view a map of the Santa Fe Community Convention Center. Water Footprint: What Is It? Aquifer Recharge from Surface Flows: Myth or Reality? Blackwater/Greywater/Rainwater - What is Best? Greywater: How to Build It In? This 3-day registration level includes two full Summit registrations. Vendor registration also includes one (1) 10' x 10' booth area, pipe & drape, 6’ table, 2 chairs, meals for 2, and Wi-Fi access. This 2-day registration level includes one full Summit registration and an exhibit booth on Wednesday & Thursday. Vendor registration also includes one (1) 10' x 10' booth area, pipe & drape, 6’ table, 2 chairs, meals for 1, and Wi-Fi access. This Friday-only registration level includes two registrations that can obtain CEUs. Vendor registration also includes one (1) 10' x 10' booth area, pipe & drape, 6’ table, 2 chairs, and Wi-Fi access. This registration level is for all students. Proof of enrollment will be requested. This registration level gives you access to all Summit events. This pass grants access to all Wednesday sessions, as well as the exhibits area. This pass grants access to all Tuesday sessions, as well as the exhibits area. This pass grants free access to all Friday sessions, plus the exhibit area, for those who are NOT pursuing CEUs. If you are seeking CEUs for the sessions you attend, please choose the Friday-only Pass - CEUs. This pass allows the attendee access to all Friday sessions, plus the exhibit area, and allows the attendee to obtain continuing education units (CEUs). If you are NOT seeking CEUs for the sessions you attend, please choose the Friday-only Pass - No CEUs and enjoy complimentary admission. A discussion about the most effective and innovatie water efficiency programs in the west and what each state can leverage to improve. This charrette runs concurrently with other educational sessions in each respective track. For those who do not wish to attend the charrette, we have other quality programming that you can attend. In New Mexico, when there is no available sewer system to hook into, a permit for a blackwater discharge system is required. These installations must be performed by a contractor with an MM1, MM98, MS1, MS3 with 3 years experience or have installed over 100 permitted systems. Taking the class explores the regulatory requirements for treatment and disposal systems in New Mexico. After the class, individuals can register for the certification test. This workshop will occur on Thursday, June 13 from 11am-3pm. Attendance in this workshop is limited to paying attendees (full Summit registrants or Thursday-only registrants) only. The course instructor is Michael Broussard. In New Mexico, when there is no available sewer system to hook into, a permit for a blackwater discharge system is required. These permits require specific information that can be confusing to anyone not familiar with the terms. This class will go over each required piece of information to correctly fill out the form the first time. This workshop will occur from 10:30am-3pm on Friday, June 14. Design Workshop - Reserve Your Time Slot! Learn how to perform a commercial hotel water audit. Hotels use a lot of water and this course will instruct you on how to test: toilets, cooling towers, commercial laundries, spas, pools, boilers and much, much more. Also covered in the class will be what a successful audit document contains, an audit checklist and guidelines. The course instructor will be Bill Hoffman. NOTE: This course will take place on Friday, June 7 and Monday, June 10. No classes will be held on the weekend. Learn how to perform a commercial water audit at restaurants. Restaurants use a lot of water and this course will instruct you on how to test restaurant related equipment. Also covered in the class will be what a successful audit document contains, an audit checklist and guidelines. The certification graduates must demonstrate their ability to audit a restaurant and pass the exam. The course instructor is Bill Hoffman. This three day, in-person course is designed to prepare the student to take the WERS certification written and practical exams. The course covers many aspects of water efficiency in housing; however, it is expected that the student have prior knowledge about landscaping & irrigation, basics of house construction & plumbing systems, building codes, and alternative water sources which will not be covered in this class but may be in the exam material. The course instructor is Laureen Blissard. The WERS Consultant is a professional designation that gives numerous disciplines a strong understanding of the WERS Program. Open to architects and designers, builders and developers, water professionals and decision makers, this 2-day course is ideal for those who will be working on WERS projects in any capacity. Day 1 runs concurrent with the WERS Verifier course. The first half of Day 2 is also concurrent, but when the WERS Verifier students depart for field training, the written exam is administered to the Consultant students. An onsite field exam is not a part of this course. The QWEL Graywater Specialty Certification provides landscape professionals with 10 hours of education on the design and installation of graywater systems. In order to obtain the QWEL Graywater Specialty Certification, an individual must be an existing QWEL graduate, must demonstrate their ability to install graywater systems, and pass the QWEL Graywater Specialty exam. This course will take place at Santa Fe Community College on June 24 & 25. The instructors will be Xubi Wilson and Doug Pushard. Tour the award-winning SFCC School of Trades, Technology, Sustainability & Professional Studies at Santa Fe Community College which offer a broad curriculum that includes degrees and certificates degrees in building science, construction technologies, drafting and engineering technologies, greenhouse management and sustainable technologies which include algae, biofuels, micro grid/ energy storage,solar, water treatment and water catchment. This Green Building Council certified LEED® Platinum building showcases many of the next generation building technologies and houses all the sustainability classes offered by the community college. The tour of this 42,000 square foot building includes the rainwater catchment where rainwater is used exclusively for lavatory use, viewing the rooftop water collectors and waste water/gray water recycling where water is used solely for irrigation use, and the brand-new ultra-low water use greenhouse growing complex. The tour concludes with the unbelievable demonstration of the Science On a Sphere® (SOS) system. This is a room sized, global display system that uses computers and video projectors to display planetary data onto a six foot diameter sphere, analogous to a giant animated globe. Researchers at NOAA developed Science On a Sphere® as an educational tool to help illustrate Earth System science to people of all ages. Animated images of atmospheric storms, climate change, and ocean temperature can be shown on the sphere, which is used to explain what are sometimes complex environmental processes, in a way that is simultaneously intuitive and captivating. Transportation from the Convention Center to SFCC is provided courtesy of the SFCC Foundation. The tour lasts approximately 4 hours and departs from the Santa Fe Convention Center at 11:00am on Friday, June 14th. This track's sessions are focused on assisting builders, architects and designers achieve greater water efficiency on their projects. This track will cover news and information on water policy. This track is geared towards field professionals, including irrigation specialists, rainwater harvesters, greywater specialists, blackwater professionals, etc. This track is only offered on Friday, June 14.